Check out our Video on the Links & Video tab. Additional GUEST BOOK reviews under Owner Info. The pictures don't do it justice, our guests say. Nicely surprised when they walk in. This property is an ideal couple getaway for any occasion. It is secluded on an old coffee plantation above Kealakekua Bay, with a dramatic sweeping ocean view of the coastline to the south. Kealakekua Bay is renowned for its terrific marine life. You can kayak, hike, or horseback ride to the Captain Cook Monument on beautiful Kealakekua Bay. Escape the noise and traffic of Kona, stay at The Captain's Suite located just a six minute drive from Kealakekua Bay also located in the historic and rural agricultural district of Captain Cook. 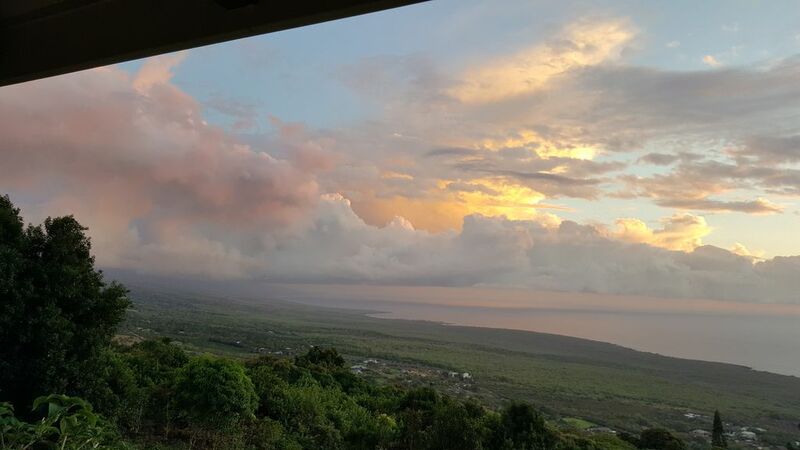 This property located above Kealakekua Bay and the Place of Refuge is a great place from which to explore the rest of the Island and then return home to your own private quiet hideaway. Snorkel Kealakekua Bay, visit the Place of Refuge State Park, take a day trip to Volcanoes National Park and the East side of the Island, visit the rain forest, beautiful Waipio Valley and a whole lot more. The many tropical flowers, trees, and fruits on the property offer a delight to the nature lover. The tropical style of the 'Captains Suite' is pleasing to our guests. It is situated privately just north of the main house, and it also has a 180-degree sweeping ocean view. The Captain's Suite has private parking close to its own double-door entry, which opens to raja slate floors throughout. Other special features include granite counter tops, a full bath with double sinks, a double walk-in shower, and two person jetted tub, which is privately situated to enjoy swaying bamboo, nature and coastline view. Additional amenities include cooking facilities, a dishwasher, a refrigerator, a King-size bed, a kitchen island, a lounge area, free laundry facilities (separate from the main house, soap & softener incl. ), ironing board & iron, bath robes, (Bring your own slippers), paper towels, TP, baggies, wax paper, foil, coffee filters, salt & pepper & sugar. Beach towels, mats, beach chairs and coolers provided. These accommodations are equipped with everything you'll need for a comfortable stay, including abundant storage, a coffee grinder, cable TV, a DVD, and a CD player. Entry is at ground level with no steps. However, the rental is not otherwise handicapped equipped. This is a smoke-free environment for your enjoyment. Sorry, no pets. We purchased this property in 1988. We built the main house and carport. In 2000 we enclosed the garage and added two units to our 1 acre property. We loved the large stand of bamboo, so it was a focal point in the design of the jetted tub for the Captain's Suite. To achieve the feel of the outside we built large screened lanai's and double sliders and windows to let in light and the views of water, flora and fauna. However always with privacy in mind. Each unit has its own parking area close to the front door. This property is in the beautiful coffee belt of Hawaii. Green and lush with beautiful ocean views. We love the tropical plants and animal life here. Birds and gecko's alike love the papaya and bananas. Turkeys and pigs roam the macadamia orchids beside us, as well and below us. We also have a small shopping center that provides a grocery store, hardware store and post office just up to the hwy and to the North. We don't get any hwy noise unless a siren occasionally, from police or ambulance. We love the rural-ness of the location, yet the convenience of a grocery store and hardware store. We moved to the Big Island in 1987 and built our home in Captain Cook in1988. We added our two vacation rentals on our 1 1/4 property in 2000. Greg is a realtor with Clark Realty Corp. and I ( Nancy ), manage our two vacation rentals. We have one dog. His name is Peaberry and is 7. Along with a Siamese cat named Mr. Mow, who is 15. It's only a 15 min. drive to Keauhou Shopping Center where you'll find restaurants, grocery store, shops and movie theater. Another 10 min. and you are in Kailua-Kona. Also only about 12 min. down to Two Step for snorkeling and kayaking. Many coffee farms and macadamia farms to visit and a must visit is the Japanese living coffee farm. Several very good restaurants here in the area as well as fresh fish at the local market and fish market. Sundays is the local outdoor market just down the road, where you'll find fresh veg. and fruits. 2 nd floor view of ocean and bamboo. Private. Double head shower, double sinks. Beautiful lush mountain views sweeping south and beyond the Place of Refuge. Extraordinary ocean and lush coastline views spanning 180 degrees, including; Kealakekua Bay, Two Step, the Place of Refuge and sweeping south along the coast. A set of four towels, hand towels and wash cloths are included in the unit as well as two beach towels. Two bath robes, hair dryer are provided for the guests. Washer and Dryer for your use, no charge in the garage. Some soap and dryer sheets provided. Private parking, in front of your unit. WiFi available with the code and password in the welcome letter, in the unit. Table and chairs on the lanai. Small private lawn with the gas BBQ. Snorkel gear, beach umbrellas, beach chairs, ice chests and float devices. Washer and dryer are free for you use as well as soap and softener, in the attached garage area, as well as the iron and ironing board. The unit has no land line phone. Most guests bring their cell phones. Verizon works great. You may use our phone if need be. In lue of air conditioning: We are located at 1100 ft above sea level with Mauka, Makai (mountain-ocean )breezes which allows us to not need air conditioning. We have ceiling fans, and a tower fan for those unexpected still days or nights to move the air. The unit also has a security screen door so that you can enjoy the breeze all night with security. We had a wonderful stay at this property! The property was very clean and well cared for. Nice quiet location if you don't mind roosters and tree frogs, but it wouldn't be Hawaii without that. The only issue is that there is another unit directly below, and you can hear each other talking on the patio. I would suggest noting that in the description or with an info placard. Once we were made aware of the lower unit, it became a non-issue. Thank you for a wonderful stay! Simply a perfect piece of paradise for some peaceful, relaxing, and rejuvenating down time. Pictures cannot do this "Place of Refuge" justice. Hosts truly care about guests having a super high quality experience. KUDOS! Very neat, clean, tidy, and well appointed. I would stay here again in a heart beat. Quiet property with the owners on site. They are gracious and welcoming but give their guests total privacy. The studio has absolutely everything you could need. It is spacious and comfortable. The best part is the huge covered, screened lanai with two comfy lounge chairs and a panoramic view. Location is ideal for exploring the island. Try Annie's Burgers for great food and great service! This is a gem in the area of Captain Cook. The condo itself is so comfortable, we sometimes found it hard to leave. There are views from the lanai to the ocean. Coffee on the lounge chairs. Well stocked kitchen and my husband loved the easy access to the BBQ. Spacious living area and bathroom. We loved the spa tub after some of our hikes. Close to some of the best snorkeling in all of Hawaii. We would return in a heartbeat. Renowned Kealakekua Bay and Place of Refuge National Park are just below this unique property. A short 12 min. drive will put you at the waters edge. Kayak over the the Captain Cook monument, have lunch and snorkel along the coast line for unbelievable views of beautiful fish, eels, turtles and frolicking dolphins if your lucky. Visit a coffee farm, botanical garden and have dinner at the renowned Keei Cafe.